The possible candidacy of Joe Biden links the two elections. His 1988 bid went nowhere, much like his run two decades later. Today, after eight years as Barack Obama's vice president, Biden is among the most popular Democrats in the country and leads the 2020 field. A poll last August had him beating Trump by seven points. But Biden faces significant hurdles before he reaches the general election. As much as Democrats like him, they'd also like to see "someone new." Biden's age (76), record of bipartisanship, insider status, and white hetero-normative cisgendered male identity might hinder his chances in the primary. It's noteworthy that former Obama advisers haven't swung behind him. 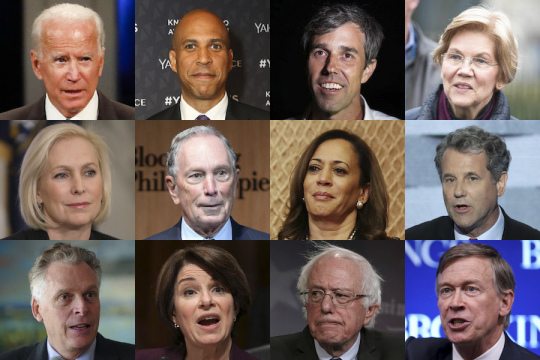 Some have been talking up Beto, and others have encouraged additional candidates to enter the race. There's a reluctance to embrace Biden reminiscent of Republican wariness toward Mitt Romney in 2012. The mayors are slightly more interesting: Mitch Landrieu, Eric Garcetti, Pete Buttigieg are novel in different ways. Unfortunately for them, a mayor has never been directly elected president of the United States. In fact, the only former mayor to become president was Grover Cleveland. Having covered a former mayor's presidential campaign in 2008, my message to these candidates is: Keep your day jobs. I am watching Michael Bloomberg, however. He doesn't mesh with the Democratic Party we see every day in the national media, but he's intelligent, shrewd, and willing to spend more money than Croesus on securing the nomination and defeating Trump. Only a fool would dismiss him. This entry was posted in Politics and tagged 2020 Election, Bernie Sanders, Beto O'Rourke, Cory Booker, Joe Biden, Kamala Harris, Kirsten Gillibrand. Bookmark the permalink.